In the province of South Sumatra, the project team will be working in the Musi Banyuasin district, where ageing palm plantations are being replanted. The PalmCow team visited the Musi Banyuasin district in late 2018. This opens up opportunities for cash crops to be planted as a source of income in the first 5 years following re-planting, while the young palm trees mature. The initial cash crop, corn, is planted by the plantations in a profit-sharing arrangement, but after this the farmers are able to plant their own choice of crops. To supplement the diet of cattle that are restricted from free- grazing the palm plantations during this period, the PalmCow team is looking to plant high yielding forage crops, as a more profitable option than the cash crops currently planted. At one site in this district, 2 hectares of newly re-planted plantation land has been inter-row cultivated, allowing for a total of 1 ha to be used as a demonstration plot for forages. A total of 8 species of grasses and legumes were planted in November, to allow several options to be evaluated for their longer-term suitability. The local farmer group are very enthusiastic to involve the PalmCow team in this trial. 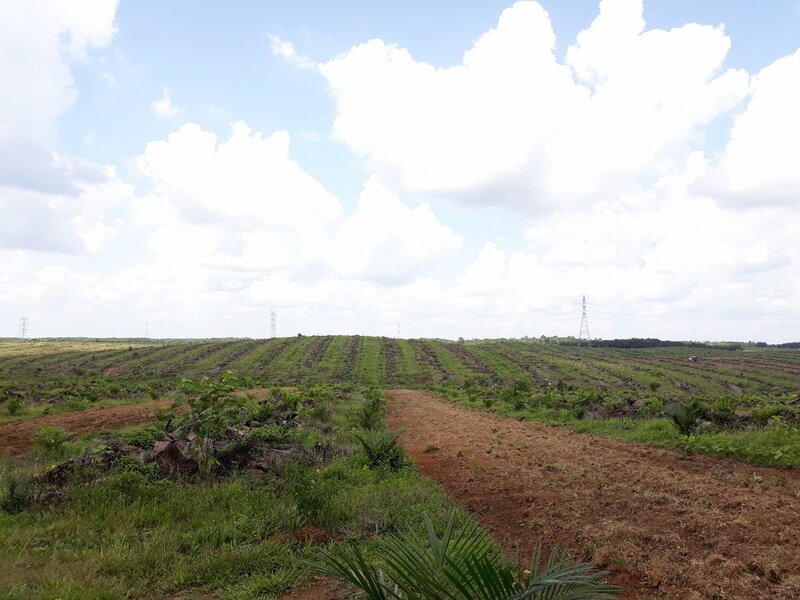 Inter-row cultivation within a recently planted palm plantation for forage crops to be planted.